Simply paste the texts to analyze in a column of your Google spreadsheet, use the menu options of our add-on and the result of the analysis will appear as additional columns within the sheet, so you can use them in calculations, filters, aggregations and visualizations like any other structured data, in a user experience fully integrated into Google Sheets. Topics Extraction: identifies appearances of named entities, abstract concepts, money amounts, and time and quantity expressions. Text Classification: categorizes the text thematically, assigning one or several categories from a predefined taxonomy. Sentiment Analysis: identifies the polarity both at the document level and at the aspect (entity or concept that appears in it) level. Language Identification: identifies the language in which the text is written, from a list of more than 160. Text Clustering: groups texts by similarity and discovers meaningful topics in a collection. And, in addition, the add-on for Google Sheets is totally free. 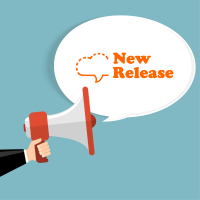 This new integration adds to our add-in for Microsoft Excel, our extension for RapidMiner, our app for Zapier, and our plug-in for GATE to make MeaningCloud the easiest to integrate text analytics tool in the market. 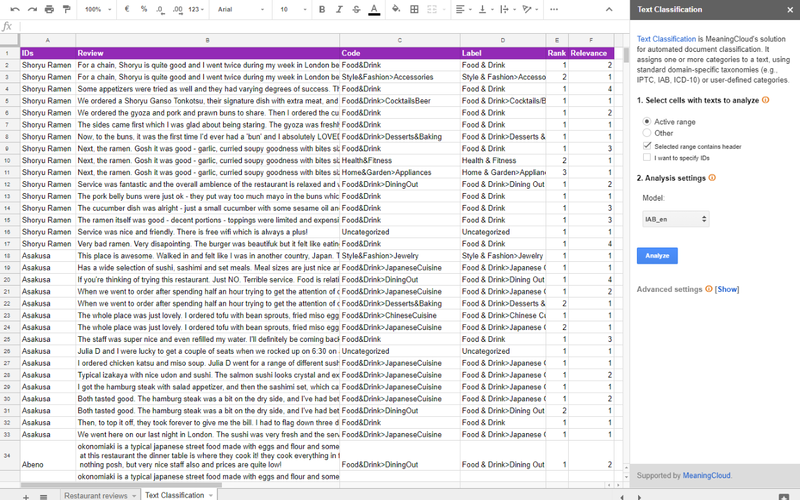 Now you can analyze your texts from within your spreadsheet with MeaningCloud for Google Sheets! And soon we will launch new integrations. Stay tuned to this channel. Is it possible to customize the taxonomy?